Books can be a bit like clothes. You get used to what styles suit, what feels right and even, perhaps, what fits your self-image. That, apart from the occasional seasonal tweak or up-grade (what’s on the Booker shortlist – or not; what’s on the Waterstones 3 for 2 table; who’s made it into the Granta Best Young Novelists to Watch list), is that. Particularly as you get older, the idea of making changes for change’s sake seems somehow absurd. There’s no-one across the Sixth Form common room to be impressed by your copy of The Portrait of the Artist as a Young Man poking out from the top of your army surplus knapsack, no one-night stands who might prowl through your bookcases and comment on your poetry selection and no-one who might be thrown by finding a Nancy Friday book in your bedroom. A glance through my reading notebook, kept more or less consistently for over ten years, makes it clear that I’m as guilty of this as many people. Much as I might like to think I have broad tastes, what isn’t there is still noticeable by its absence. Margaret Atwood aside, there’s no sci-fi; other than His Dark Materials, there’s no fantasy; dystopia makes only a brief appearance (Margaret Atwood, again, and two post-apocalyptic novels – Julie Myerson’s Then and Emily St John Mandel’s Station Eleven – lent to me by writing group friends) and there are no thrillers at all. “Classics” appear only infrequently and, much as I might like to pretend it’s because I’ve read so many of them already (I don’t note re-reads), I know there are legions still waiting ahead. Oh, and there’s just one play (Schnitzler’s Professor Bernhardi) and that’s there only because I saw a friend perform in it at London’s Arcola Theatre. As an example, here is my current reading pile – by which I mean the books I’m actually reading at the moment; it’s never just one. 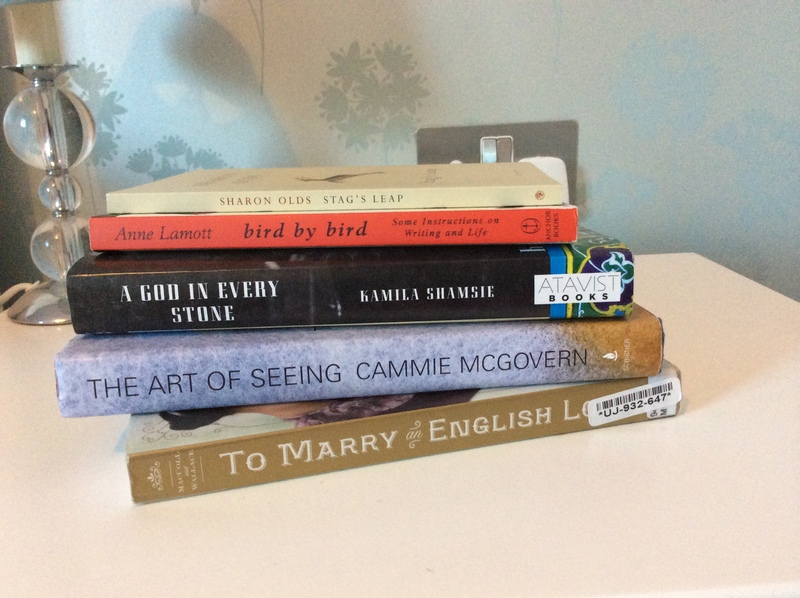 From top to bottom, there’s one poetry book (Stags’ Leap by Sharon Olds), one writing craft book (Bird by Bird by Anne Lamott), one (historical) literary novel (A Girl in Every Stone by Kamila Shamsie), one contemporary novel by a writer now better known for her YA (The Art of Seeing by Cammie McGovern) and one history book I’m only a dozen pages into (To Marry an English Lord by Gail MacColl and Carol McD Wallace). Pretty standard stuff for me, really. But always with the potential for excitement too. Staying within your comfort zone does not mean not enlarging your horizons. Set largely in pre-partition India, A Girl in Every Stone plunges its two central characters into a maelstrom of history that stretches from ancient Persia to pre-first world war Turkey and on, via Ypres and Brighton Pavilion, where Indian Army soldiers are restored to some sort of health, to Peshawar. It’s quite a canvas and its author is not afraid to tackle those issues of politics, faith and national identity that are, so sadly, still resonating today. For an armchair traveller such as myself, this is one author I’ll be searching out more from; and that’s so even if I am, at two-thirds of the way through this book, growing in certainty that the stunning prose and the epic sweep of the book are in danger of washing away the characters that the reader is, presumably, supposed to care about. If A Girl in Every Stone has enlarged my horizons so, in a smaller, quieter way, has The Art of Seeing. Ostensibly a story about sisters – the younger a talented would-be photographer and the elder famous, from her late teens, as a movie actress – and what happens when their worlds reverse, it’s more nuanced than that, touching on envy, the strange nature of celebrity and how easy it is not really to know those who are supposed to be closest to us. Given that the author is herself just such a younger sister of a famous actress it might be easy to suppose this is a defining theme of her work but it really isn’t – and I’m looking forward to reading more. It’s this generosity that makes these poems fly. And that is what I most want from any book. Lovely to see what you’re reading — other people’s nightstands are endlessly fascinating! I read ‘Stag’s Leap’ earlier in the year & loved it. And Kamilia Shamsie is an author I always think I’d really enjoy & then never get around to reading — from your description it sounds like I just need to try harder. Definitely worth a go when you get space on your nightstand! I’m going to try Burnt Shadows next.